At the Pacific Tsunami Warning Center in Ewa Beach, geophysicist Brian Shiro, front right, shows the new seismometers and accelerometers that are being installed. Emergency agencies will test a new technology in an exercise tomorrow focusing on a potential tsunami-generating Big Island earthquake, says Edward Teixeira, state Civil Defense vice director. Planned as part of Tsunami Awareness Month and coinciding with monthly Civil Defense siren tests, the exercise offers a chance to use some new instruments in the warning system. The system must be ready to respond rapidly, since there is "no tsunami season and no advance notice that a big earthquake is about to happen," said Charles "Chip" McCreery, geophysicist-in-charge, Pacific Tsunami Warning Center. "We continue to make progress all the time in enhancing our capabilities, and certainly we have, in a way, benefited from the Indian Ocean tsunami," McCreery said. Additional federal funding was provided for the system after the Dec. 26, 2004, disaster, he said, adding, "I'm very excited about a lot of things going on." Among them, instruments are being placed farther up the island chain that will allow scientists to do a better job of evaluating earthquakes more quickly, he said. Deep ocean tsunami-detection buoys and numerical modeling also "will give us a lot more confidence about what's coming toward Hawaii," McCreery said. 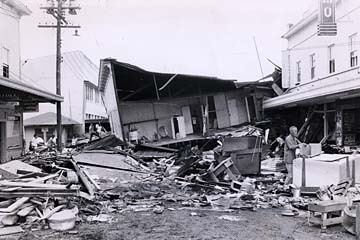 The 1960 tsunami caused major damage in Hilo and killed 61 people. No warning was possible when an earthquake with a reported magnitude of 7.8 in the Aleutian Islands generated the most devastating tsunami in Hawaii's history on April 1, 1946. It killed 159 people, mostly on the Big Island but also on Maui, Oahu and Kauai. The Pacific Tsunami Warning System was established as a result. "We're lucky," McCreery said, "because Civil Defense here is very proactive on tsunami hazards, even though we haven't had a major destructive one since 1960." Warnings were issued for the 1960 tsunami from Chile, but many people didn't pay attention, and 61 were killed, according to records. With more federal money for the tsunami warning system, geophysicist Brian Shiro said, 12 new broadband seismometers are being installed throughout the islands, each with a strong motion seismometer known as an accelerometer. Four have been installed, including the first seismometer on Kauai, and others are in the works. "The broadband allows us to see the bigger picture and understand the source of the earthquake better, how it ruptured and whether a tsunami is likely or not," Shiro said. Fifteen additional accelerometers also will be installed, including 11 coupled with existing short-period seismometers, he said. 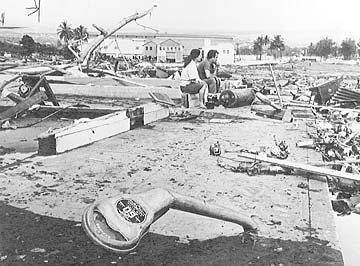 The battlefield look of Hilo is shown after tsunami waves struck the Big Island, crumbling buildings like matchsticks and dominating news coverage. 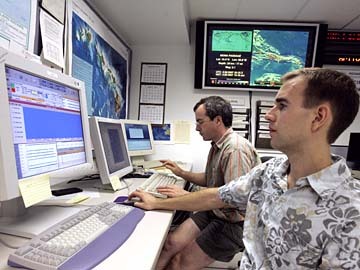 Geophysicist Robert Cessaro said the warning center began getting broadband seismic data from around the globe in 1996. This eventually enabled the scientists to locate an earthquake "practically anywhere on the planet, and get the size and location pretty quickly," he said. The Tsunami Warning Center is using its accelerometers for earthquake location and "also tinkering with techniques that allow us to determine the magnitude," Cessaro said. After analyzing seismic data, scientists rely on ocean buoys, and as Cessaro pointed out, "No information you can get from an earthquake other than magnitude gives you much sense of what's going on in the water." Helping to overcome this gap are 23 Deep-ocean Assessment and Reporting of Tsunamis buoys deployed across the Pacific by the National Oceanic and Atmospheric Administration. One is located off the Big Island. "The DART buoys allow us to do something we've never been able to do before, and forecast the height of a tsunami at different places," Shiro said. Dan Walker, tsunami adviser to the Oahu Emergency Management Department, and Cessaro also have what they call eight "tsunami warning centers in a box" on the Big Island. The instruments, generally located 10 feet above sea level and 100 feet inland, send a signal within 30 seconds to the warning center when they are flooded. "What's really needed now is something that not only detects the presence of water on land but a receding wave," Cessaro said. Shiro said the agencies came together after the Sumatra tsunami to share information and coordinate efforts in a Hawaii Integrated Seismic Network. The seismic upgrade is being done with the U.S. Geological Survey, Hawaii Volcano Observatory and the National Strong Motion Project, which together have 35 strong motion stations in the state, he said. Some of the new money will be used to upgrade the USGS's "dial-up" strong motion stations to real-time communications so they will be more useful, he said. One goal of the improved instruments is to avoid having too many warnings, which erodes confidence in the system, McCreery said. "The gap is really trying to keep the public prepared to do the right thing when the situation occurs." Tomorrow: Getting the public to respond to tsunamis. Robin Bond was diving with intermediate school friends in Hanauma Bay in 1957 when he felt the current "go one way, then come back up and go back down. "I figured that's not right," he said. I looked at the keyhole area of the bay. Water was coming out. It had dropped below the level of the reef and was pouring out of the inside reef. "You couldn't hear any of the alarms," recalled Bond, now 65. "We were skin-diving, going up and down, not paying any attention." But they knew it was a tsunami, he said. "When it hit, we just took off running. We grabbed our stuff and went to the top of the lookout where it is now and watched the waves." The 1957 tsunami was generated by an earthquake in the Aleutian Islands and caused extensive damage on Kauai. Bond said he grew up on Portlock Road and remembers many times when his father would get them into a truck to go to the top of Koko Head and wait until there was an all-clear. "My dad was a smart guy, especially when it came to the ocean. He said, 'Never go back and look. Don't go near it. Get away.'" Bond, who worked 15 years for the Parks and Recreation Department, said he does a lot of diving and fishing. "A lot of guys I've grown up with, they brag about running down (to the beach) looking for fish (after a tsunami alert). I just shake my head. I know when it hits, you better be out of there, because if not, you're gonna get whacked." » April 1-30: Tsunami display window at Borders Books, Waikele. "Science of Tsunamis and Safety Information." » April 17: Bishop Museum lecture, 6 p.m., Gerard Fryer, geophysicist, Pacific Tsunami Warning Center, "Tsunamis: Waves of Destruction." » May 17: Hanauma Bay lecture, 6:30 p.m., Gerard Fryer, "Tsunamis: The Great Waves." » Today: Pacific Tsunami Museum Talk Story Day: "A Taste of Mamo Street," 6 p.m., Sangha Hall. » Thursday: Remembrance Day, 9 a.m., Laupahoehoe Park. » Friday: Pacific Tsunami Museum private ceremony with Dr. Ronald Yamaoka. » April 20: 19th annual Earth Day Fair, 9 a.m. to 4 p.m., Hawaii Community College, with National Oceanic and Atmospheric Administration booths, displays, tsunami information. » April 28: Ocean Day, 10 a.m. to 4 p.m., University of Hawaii-Hilo.